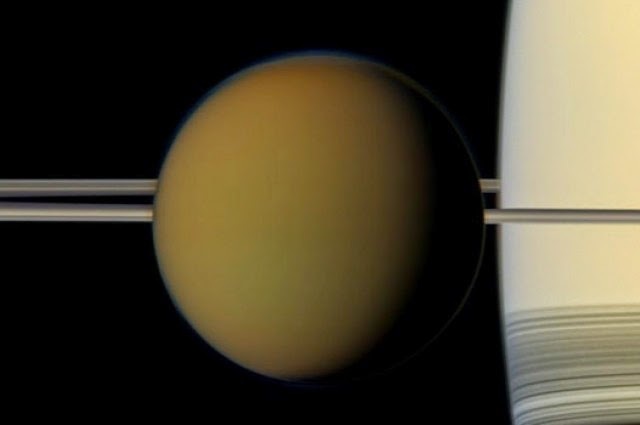 Nitrogen in the atmosphere of Saturn's moon Titan's was made at temperatures a lot more colder than Saturn itself, flinging a major curveball into notions of solar system creation, counting the origins of our own atmosphere. Similar to Earth, Titan's atmosphere is mostly nitrogen, and supposed to serve as relatively a decent model of environments on the early Earth. Maximum of it is nitrogen 14 but it also covers nitrogen 15. Both are steady and while nitrogen 14 would be to some extent more inclined to escape Titan's gravity to space, calculations by Dr Kathleen Mandt of Southwest Research Institute specify this would not have happened to an amount that would change the configuration over the era of the solar system. Therefore, Mandt could relate Titan's nitrogen ratio with that of other things in the solar system. In the Astrophysical Journal Letters she exposes that Titan's atmosphere matches the nitrogen originates in ammonia in comets from the external reaches of the solar system, but not on Earth. The paper concludes as: “Titan’s atmosphere must have originated as ammonia ice formed in the Protosolar Nebula under conditions similar to that of cometary formation,”. The comets of the external reaches of the solar system are supposed to exist before the planets, counting Saturn. Mandt has earlier found that the methane in Titan's atmosphere is much fresher, less than a billion years old.